I won Luxe tickets to London Fashion Weekend and an overnight stay at the May Fair Hotel with Stylist Magazine. Included with my tickets was a Pringle Tote bag filled with goodies. You can imagine my excitement when I opened up my bag to discover these Maybelline and Essie gems! 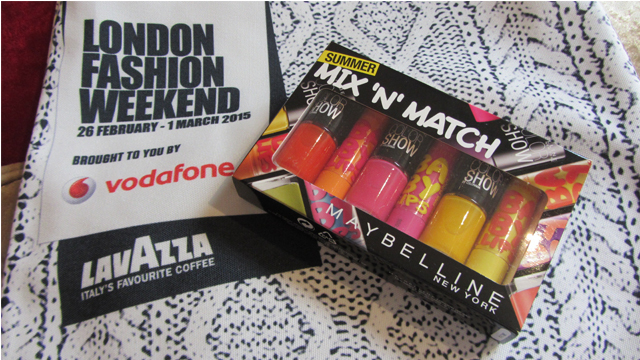 At the show, Maybelline had a pick’n’mix area where you could select from a huge range of Baby Lips lip balms and Color Show nail polishes. They also had a room where it looked like you might have been able to get makeovers but I was too late and the door was literally shut in my face! Oh well. I resisted the urge to go for the pick’n’mix for two reasons – the first is that I have far too many nail colours, many of which I have not even worn. The second reason is that I received a gorgeous Summer Mix’N’Match set with three summer bright nails colours and three Baby Lips lip balms (which I’ll stick on my skincare blog) in my tote bag. I think that’s enough to be getting on with! Pink Bikini – a hot pink and I really love my hot pinks! As for Essie, if I had arrived earlier I could have had an Essie manicure in the Essie room. Not to worry as I was wearing my Elegant Touch Express nails, very quick and easy! 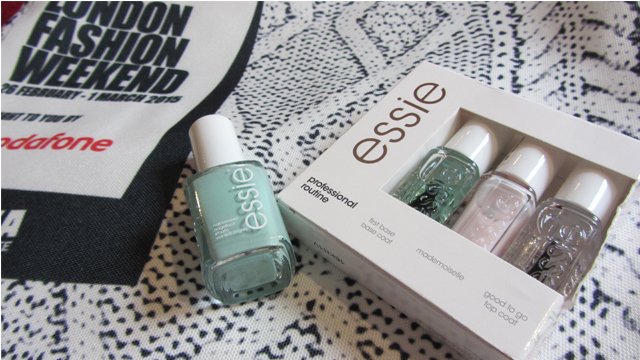 In my tote bag there was a full sized nail colour in ‘fashion playground’ – a mint green. I have so many mint greens – I just can’t stop buying them as it is my favourite spring colour so I’m very happy with this! I also have a professional routing set of minis which contains ‘first base’ base coat, a delicate pink nail colour called ‘mademoiselle’ and ‘good to go’ top coat. I think I’ll have to start painting my nails again!